Artist impression of the air source heat pump and key features. The heat pump is projected to run for more than 20 years, providing the housing estate with security for the future. The heat pump has been built within the new decarbonisation targets which were set by the Government to reduce carbon emissions. 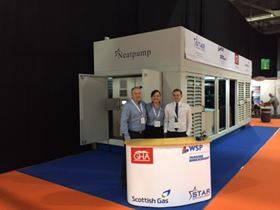 The heat pump featured at All –Energy, where it exhibited its UK heat pump project. An industrial size air source heat pump will be capable of delivering affordable, low carbon heating and hot water for vulnerable households across Scotland’s existing housing estates. It was said to be a completely new concept of district heating at the UK’s largest renewable energy conference and exhibition, All-Energy, which was held in Glasgow last year. “We’re looking to gain fuel poverty alleviation for Hillpark Drive, Glasgow, UK. It is a 350 home social housing estate built in the 1970s currently fitted with electric storage heating, to build a more sustainable community. Heat pumps weren’t even a factor at the inception of this project as we had never thought it would be possible to work with heat pumps on this scale. GHA has only worked with small, individual heat pumps which we found to be unsuccessful. However, this is a different beast,” said Colin Reid, Energy & Sustainability Manager at the GHA, part of the Wheatley Group. Developed by a joint partnership between Glasgow Housing Association (GHA), energy consultants WSP Parsons Brinckerhoff, heat pump manufacturers Star Renewable Energy, the new renewable heating technology is expected to become the pathway to zero carbon, cheap heat for existing social housing stock. 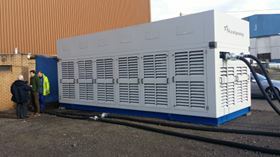 The 400 kW/h air source heat pump is designed to be installed at an energy centre and connected to a centralised district heating network which will deliver low carbon heat to six buildings plugged into the scheme. 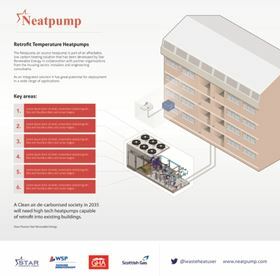 At 8 metres long and 10,000 kg in weight, the air source heat pump incorporates in-built control systems to enable remote monitoring and ensure optimum efficiency throughout its life-cycle, an expected 20+ years. With the use of the robust industrial manufacturing components, higher water temperatures of 60°C are achieved, allowing for regular radiators to be used. Air source heat pumps are perfect for the UK’s mild climate as warmth is extracted from the outside air and then boosted up for distribution via a “wet” central heating system to the whole housing community. This will be the first time an ASHP installation in Britain will provide central renewable heating for a block of high rise buildings. “Many people believe that renewable energy is solely for modern buildings, however our new development demonstrates that this is most certainly not the case. In the UK, 99% of our properties already exist. If the government’s ambitious targets for a complete cessation of fossil fuels for heating is to be realised, we need sustainable and lower cost central community heat pumps capable of retrofit without the constraints and high infrastructure costs associated with other renewable technologies,” said Dave Pearson, Director of Glasgow based Star Renewable Energy. Ewan Jures, Principal Engineer at WSP, gave details of the different options and factors affecting deployment of other low carbon technologies in the Hillpark Drive project, adding that they could not be deployed as “cost-effectively and rapidly” as the community air source heat pump. “Biomass suffers from access for deliveries, air quality concerns and flue stacks; combined heat and power was off gas grid and has low grid export prices, ground source heat pumps were not an option as there was a lack of available and suitable grounding in the area, water source heat pumps were not suitable as there was no nearby body of water,” he said. With Scotland’s target set for removal of all carbon from heating systems by 2050, the support for the take up of heat pump technology is growing with a view to decarbonising the grid further, which will continue to improve the performance of the heat pump and bring carbon emissions down. To decarbonise the heat sector, new technologies need to be developed and deployed on a "large-scale" basis and integrated into the "wider energy system", Scottish Renewables said. 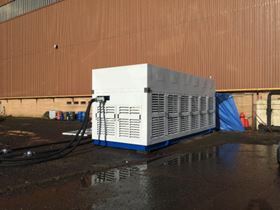 The air source heat pump exhibited at All-Energy, an event which is a highlight in the renewable industry calendar. Attracting representatives from a whole host of renewable sectors, including onshore and offshore wind, bioenergy, wave and tidal, sustainable cities and energy efficiency, the exhibition provided attendees with the unique opportunity to learn more about the new developments in the industry, such as the community heat pump. Xylem appoints Jason Howlett as its new managing director for the UK and Ireland, overseeing the sales and services divisions.